Hollywood 1963-1976 chronicles the upheaval and innovation that took place in the American film industry during an era of pervasive cultural tumult. 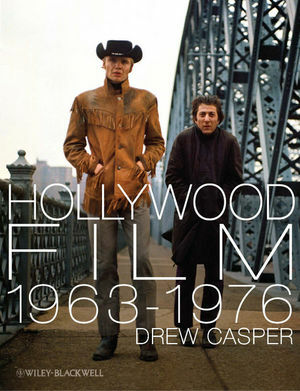 Exploring the many ideologies embraced by an increasingly diverse Hollywood, Casper offers a comprehensive canon, covering the period's classics as well as its brilliant but overlooked masterpieces. Drew Casper is the Alma and Alfred Hitchcock Chair of American Film at the University of Southern California’s School of Cinematic Arts. He is the author of Postwar Hollywood, 1946-1962 (Blackwell, 2007), Introduction to Film Reader (2007), Stanley Donen (1983), and Vincente Minnelli and the Film Musical (1977). He has contributed on many DVD commentaries for documentaries of classic and contemporary Hollywood films. Civil Rights Legislation and Protests. The New Left, the Counterculture, Neo-Conservatism, and the Silent Majority. Ecology, Good Health, and Fitness. A Sense of Confusion, Impotence, and Cynicism, and a Wave of Nostalgia. The Practices of the Seven Major Studios: Lesser Movies, Higher Costs, Independent/Runaway Production, Sources, Stars, Sequels/Series, Mainstreaming Exploitation, “The Big Kill,” “The Youth Movie,” “A Film By,” Diversification. Competition: Minor and New Studios. Additional Practices: Downsizing, Negative Pickup, Co-Production/Distribution, Tax Breaks/Shelters. Still Other Gambits: The Nostalgic Wave and The “Special Event” Movie. 5. Exhibition and the New Audience. 6. Color, Screen Shapes, Sound, Special Effects, and Production Refinements. 7. Documentary and Documentary Realism. 8. TV and TV Theatrical. 9. Modernism, TV Programming/Commercials, the Avant-Garde, and Expressive Stylization. 10. Issues, Solutions, and Problems. Dilemma: The Pawnbroker (AA, 1965). Turning Point: Who’s Afraid of Virginia Woolf? (WB, 1966). The 1966 Production Code Guidelines and the “SMA” Category. Enlightenment of the Legion of Decency. Divorce: Hollywood and the Church. City/State Censorship and the Liberalization of the Supreme Court. 15. Horror and Science Fiction. Road Film and Biker Film. Musical Comedy and Musical Drama. 18. Social Problem Film and Courtroom Drama. Appendix: Hierarchical Order of Ten Box-Office Stars, 1963–76.